Essentially, these are some of my slides from a TechEd presentation last week (MOB205). 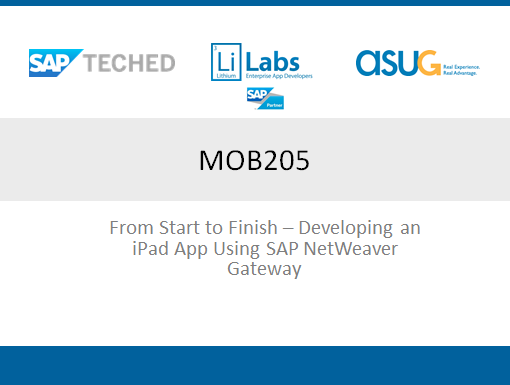 My position with this presentation is to depict the overall process I use when developing an app, a few of the *many* considerations to make, as well as the simplicity of using a product like Gateway to actually connect and “consume” ERP/CRM/Back office data in a few lines of code. The mobile landscape is fairly complex right now, lot sof vendors, lots of choices and not particularly easy to navigate. One this is for sure, services are here to stay – particularly REST based web services and that is exactly what Gateway is built for. Another great product: XS Data Services for HANA …. So this is the app being designed during the presentation. Essentially my goal was to develop a “template” type app which the attendees could download and use as a starting point for their mobile app development and encourage them to get their feet wet. The app makes 2 service calls. 1 to pull a list of customers from SAP ERP, once selecting a customer, the app would download the additional details of the customer including the address. And lastly – the “idea” … anyone wanting to customize the app could pull additional data in, a good example would be: An Accounts Receivable Clerk who attends a weekly open payables meeting, may want to take their iPad, get a list of customers, select one in question and see all open payables which are relevant … easy to do with this type of structure and simple to implement. Another example was a Business Development road warrior who could select a customer, and see a list of Open Quotes. During the presentation I also reminded folks that mobile apps can be powered by a variety of data providers, including a method we (Lithium labs) did a couple years ago which was actually using SAP.Net Connector (v2.0) to create a ASP.NET Web Service (XML) which was called from the mobile device which worked and is still in production today. In this app, all the components are distributed. The Netweaver Gateway instance in the cloud at AWS (Thanks John!) and connected to a ERP backend which is in Walldorf (ES Workplace). The app talks to the AWS GW machine which pulls the data from the ERP and gives it back to the iPad via a REST web call. Now that we have covered the platform, we will go through the prerequisites for developing the iPad app. We will cover the development machine types, software need and useful tools. A mac development machine is recommended, when I started out 3 years ago, I tied to put together a hackintosh … didnt work, first update and it bombed… waste of time. A used mac mini off craigslist goes for +- $300 … worth the investment. This is an overview of the developer accounts – most important point was that with the free account you cannot run your app on a physical device … (boo). Pay the $99 if you are getting started and if you develop something your company wants to deploy on a larger scale … i.e. > 10 devices, pony up to the Enterprise Program. RESTClient for Firefox has saved me multiple hours … a quick and easy way to test your services before development. Overview of the “SDLC” we will be following in Part 2…. click here…..